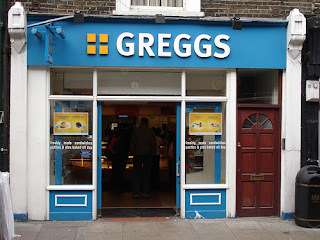 RANTPARROT - I GET CROSS A LOT: Greggs - service with a snarl. I have been known to go to Greggs on occasion. I do so now not for the rich buttery flavours of their amazing treats, but for the surly nature of the staff. I was there last week when a woman, who had clearly been fired as a school dinner lady for tar and feathering a child, looked at me angry eyed and said 'what'. An uncompromising opening gambit I thought for a shop trying to make me spend money. I said: "I didn't know you served chips. "We don't", she responded with her easy charm and rasping voice. I said: "Well can I have the one on your shoulder then please?" It didn't go down as well as I had hoped and she just sighed, smiled a one lip grin and said 'what' again. I am pretty sure she was pretending to chew gum as well. There is simply not enough of this type of crossness, of understated rage and disdain in Britain's service industry today. Too much have a nice day when if I was having a nice day I wouldn't be rushing lunch in a Greggs. I got a cheese and onion pasty and she snarled: "Is that it?" "Is that what, a cheese pasty? Yes I think it is. That's what I asked for anyway. Is it, you should know? You have me worried now. It's not a doughnut is it?" Her eyes called me a prick while her sunken mouth said: "No I meant is that all you want?" I was unsure: "I don't know, what do you think?" She bored of me wonderfully and walked away. The pasty burnt my mouth with every bite. It burnt my throat on the way down and set fire to my gut when it landed with a "plop". I fear for the short term future of other bits of me. I didn't remember ordering a cheese, onion and molten lava pasty but there you go. They could insulate homes with these things, the heat never goes away. 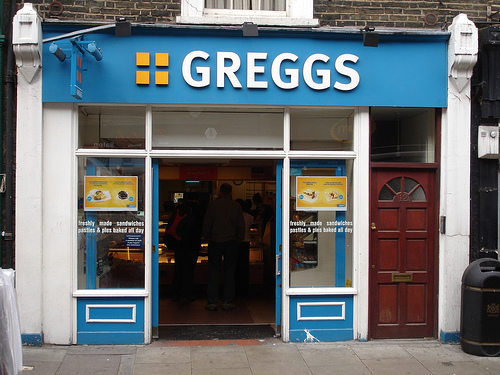 I will be monitoring staff at Greggs in the coming months and shall report to their HQ any staff that I find being polite. Try them yourselves, stand in front of the doughnuts and ask if they have any doughnuts, when they sigh and say yes they are just here, ask for a cream one and when they point one out, hum the theme from Rhubarb and Custard briefly and ask for a steak bake. I did it once and the response was fantastic. I will tell you what it was if you try it. Service with a snarl - the only way to get hold of utterly unhealthy salty volcanic treats. I will report back every other week or so on the progress of the staff. I am fully expecting a customer to get punched for asking for a sausage roll, it may be me.